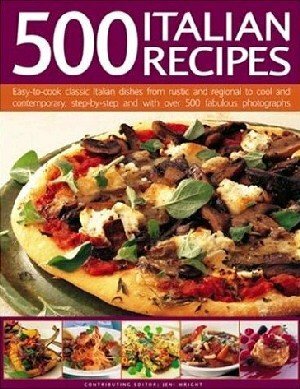 This is a comprehensive collection of 500 authentic Italian recipes - from antipasti through to zabaglione - with tempting and tasty ideas for every part of the meal and every occasion. This title features warming soups, sizzling pizza and satisfying savoury breads, succulent ragus and roasts, chargrilled fish and shellfish, and a fantastic range of pasta, polenta, gnocchi, noodle and rice dishes, well as delectable desserts and ices. It includes all the popular Italian classics such as risotto, cannelloni and lasagne, pizzette and calzone, and zabaglione and tiramisu, as well as lesser-known regional specialities such as chicken with ham and cheese from Emiliga-Romagna and grilled fennel salad from Tuscany. Italy is rightly regarded as one of the world's greatest cuisines. From the sundrenched Mediterranean to misty Alpine slopes, the country is a patchwork of wonderfully varied regions and culinary traditions, each featuring its own typical ingredients, cooking methods and recipes. This amazing diversity is celebrated here in an incredible collection of 500 recipes. From the simple pizza to the elegantly refined ristorante meal, this wide-ranging recipe book includes everything you would expect to find and more. All the Italian favourites are featured: palate-pleasing soups and antipasti, all the pasta variations, risotto and polenta dishes, succulent fish, shellfish and meat courses, temping salads, breads and sauces, through to the dreamy desserts and cool gelati.